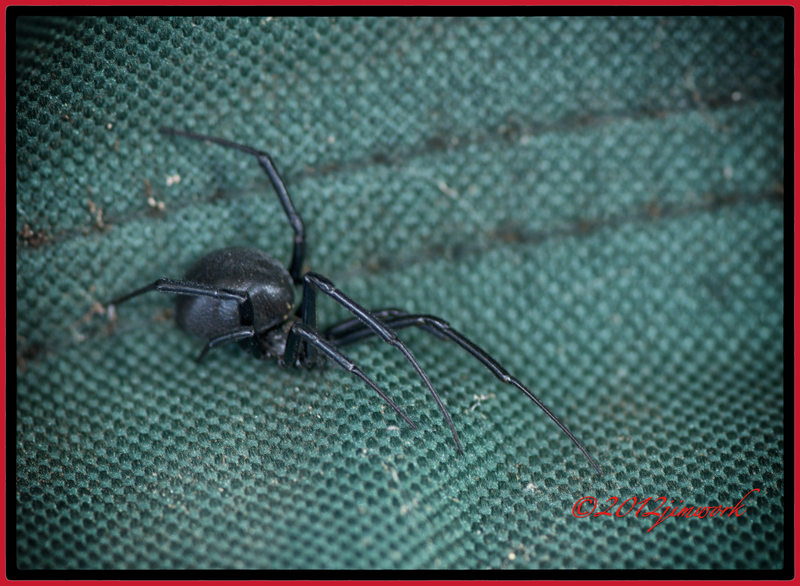 This was not the photo that I had hoped for of this black widow. They are fairly common here in West TX and I was actually excited to find one with a web built in a portable chair in my back yard. I used a little stick to kind of guide her down where I could see her a little better. I had vision of this great spider photo, some how being able to see the red hour glass on her belly. My muse shouted a motherly “be careful”, but I did a quiet snort like what can happen I am just making her image. I wasn’t like wrestling alligators. I got my 105mm micro lens and set up pretty close to her, I was like 6-8 inches away. I got this one exposure of her and was planning a second when she literally leaped, jumped, sprang, whatever like straight up and out of frame and sight. I quickly checked my arms, head, clothes and camera and I could not find her. She had vaporized, gone, not to be found. I went in and changed clothes, even took a shower, but all day I had this imaginative itch that I could not get away from. A little creepy, but nice. I appreciate your commentary on how you were planning for a great shot and then life happened. I think that we have all been there. Nice shot, though you paid for it in fear. A friend of mine found a barn near Wichita Falls that was infested with black widows. She had some great photos, including one of a spider eating her mate. Not sure if it was worth it.